Based on an internationally acclaimed format by BBC held in 22 countries, the initiative is to select that one great Indian after Mahatma Gandhi who is the most influential, iconic & inspirational and has impacted your life. Give a missed call from any number on Landline or mobile to 08082891031. It is FREE! One of Indian cinema’s most popular male playback singers, Mohammed Rafi reigned over the world of Hindi film music for almost 40 years. Be it a romantic number, a classical tune, a patriotic number, ghazal or a bhajan Mohammed Rafi had the ability to adapt his voice to the mood and is considered by many to be the most versatile singer ever in the history of Indian cinema. Inspired by singers like KL Saigal and GM Durrani, Rafi began his career as a singer in Lahore in 1941 with a Punjabi film, later moved to Mumbai in 1944. In 1948, after Mahatma Gandhi’s assassination, Mohammed Rafi reportedly overnight created the song ‘Suno Suno Ae Duniyawalon, Bapuji Ki Amar Kahani…’ and later received a silver medal from Prime Minister Jawaharlal Nehru on the first anniversary of the Indian Independence Day. While looking for work, Rafi reportedly met music composer Naushad with a recommendation letter from Naushad’s father and Rafi soon took Talat Mahmood’s place as Naushad’s favourite singer. Rafi had successful associations with almost every mainstream music composer he worked with, be it SD Burman, Shankar Jaikishan, OP Nayyar or Madan Mohan. 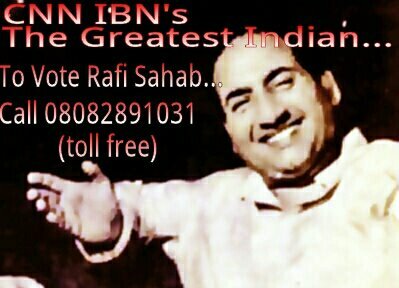 Rafi was honoured with the Padmshri in 1967 and won 6 Filmfare awards over the years. Though the legendary singer took a break and chose to sing fewer songs in the 1970s, his popularity did not wane. Infact Rafi won the National Award for playback singing as late as in 1977 for the song ‘Kya Hua Tera Vaada…’ from ‘Hum Kisise Kum Nahin’.